Just like the silk saree that evokes jewel-like emotions within its wearer, Jaya Mehta brings a rich and sumptuous feel to poetry in 'the Poetic Saree'. The poems in this collection emerge from the dancer's dance. They are inspired by the themes of Indian art, the delights of nature, and the emotional landscapes of the heart. 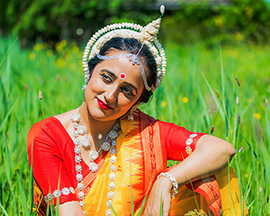 Performed at the India Dance Festival and the International Poetry Festival in Netherlands, published by the Levure Litteraire and filmed as videos in the 'Poetic Saree project', these poems have a powerful multi-disciplinary quality that leaps off the page. Accompanied by the bright, lilting notes of the classical guitar, the dancer has narrated the poems in an inspirational audio book. With the belief that poetry is music in words, and it must be 'heard', Jaya Mehta has narrated the poems to create a refreshing river of poetry. The poems in their audio avataar, cascade onto the ears, and brighten and inspire each day. The talented film maker, Shabani Hassanwalia has filmed poem-dance videos with dancer Jaya Mehta in the beautiful backdrop of the Sanjay Van forest, the Neeli Hauz lake and the historic Hauz Khas complex in New Delhi. 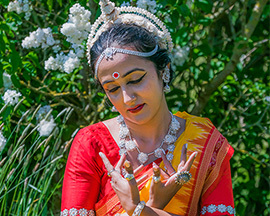 Inspired by the colours of the Odissi saree, and the experience of its dance, the videos mirror the inner and outer landscapes of the artiste. that reside in each other's hearts..."
sing many surprises these days.."